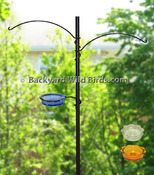 Visit the Websites below to learn how to build a great habitat for yourself and your Backyard Wild Birds. Add A Link - Add your Website to our resource links below. Landscaping Pasadena - Pasadena's Best is your go to source for all things landscaping. For almost 30 years, out staff has been providing professional landscaping design services to Pasadena, MD and vicinity. Backyard Birds of Modesto - is for the beginning Modesto birder, and anyone else who enjoys observing birds, spending a little time enjoying nature online. Guided Birdwatching - Guided Birdwatching.com is the link between the traveling birder and birding guides all around the world. Long Island Birding - A site about Long Island Birds and Birdwatching with great photos and information. Two Little Finches - Finch species information, photos, and information on caring for your pet finch. American Birding Association - only organization in North America that specifically caters to recreational birders. Contributes to bird and bird habitat conservation through a variety of programs. Baltimore Bird Club.org - Backyard Birding Page, a service of the Baltimore Bird Club with know how on what to feed the birds, how large to make the entry hole on a bluebird box, or which shrubs and flowers to plant in order to attract birds. Bird Forum - Bird Forum is the net's largest birding community, dedicated to wild birds and birding, and is absolutely FREE! Hummingbirds.net - Learn all about the hummingbirds of North America. Includes photos of known breeding species, feeder tips, and more. National Audubon Society - Who's mission is to conserve and restore natural ecosystems, focusing on birds, wildlife and their habitats. New Jersey Audubon Society - is one of the oldest independent Audubon societies that acquire, establish, and maintain wildlife sanctuaries and educational centers. Cape May Bird Observatory, NJ - is a great bird migratory destination that is renown by birders for its species diversity, and migratory concentrations. Cornell Lab of Ornithology - whose mission is to interpret and conserve the earth's biological diversity through research, education, and citizen science focused on birds. Bird enthusiasts can learn the scientific process by participating in real, hands-on Bird research projects. North American Bluebird Society - You can learn about the different species of bluebirds, how to attract and care for them, download educational materials and last but not least, join our conservation efforts. Birding Pal - Find a birder to go bird watching with anywhere in the world.